It’s been a few months since my last purchase. I have been enjoying my line-up of Pilots, but I was tempted by these two. I included a summary of features at the end to show how they stack up against the Pilot 823 (my personal standard comparison). I have a few Aurora rollerball pens, but this is my first Aurora fountain pen. I could not resist the black stealth of the 88 Nera Unica. I inked it with Pilot take-sumi. The piston filling mechanism was unique but very easy to use. The ink window is something that I wish every pen had. The pen is lighter than I expected, but I think I like that. The fine nib is a little thicker than I expected, but I think I like that too; it flows a smooth line and the blacked-out 14k gold is sweet. I am glad I didn’t go with a medium nib because it might have been too thick for my taste. Overall, the pen is nicely balanced and comfortable to hold. I can foresee a lot of pages being filled with this one. I already own the Retro 51 pen/pencil set, so it was a moral obligation to add the fountain pen. I inked it with Pilot take-sumi. 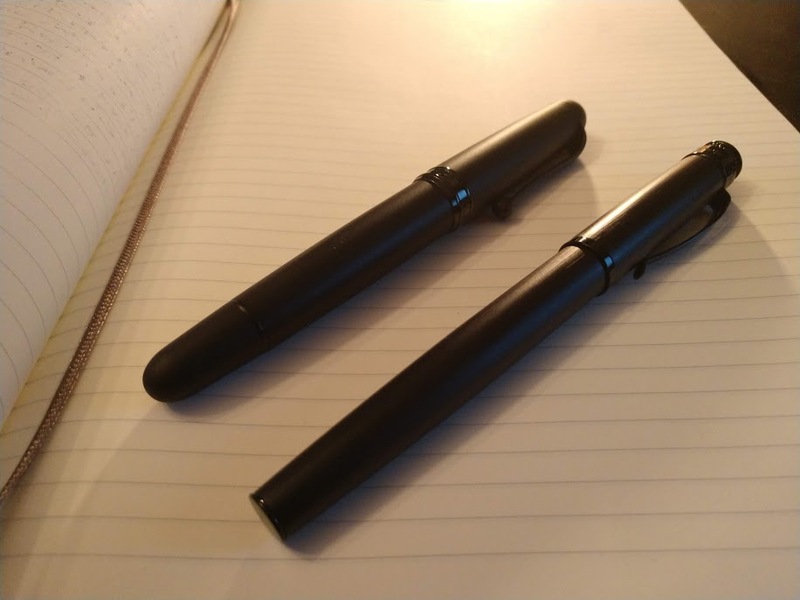 I’ve been spoiled by vacuum filling pens, so I wasn’t a fan of the converter; it comes with two ink cartridges that I tossed straight in the trash. The Retro has a noticeable heft compared to the Aurora even though it’s only one gram heavier. The body seems thin for a fountain pen; it is comparable to its rollerball cousin, so that makes sense. The steel nib was a turn-off at first, but it writes smooth enough that you’d swear it was gold. Overall, this pen looks great and functions well enough to be in a league with much pricier pens.